The following is a guest article by RADM Thomas S. Rowden, USN. I am indebted to the leadership of CIMSEC for providing a platform for me and senior members of my team at OPNAV N96 to lay out for readers key parts of our vision for the future direction of Surface Warfare. Captain Jim Kilby started it off with “Surface Warfare: Lynchpin of Naval Integrated Air/Missile Defense”, and Captain Charlie Williams followed up with “Anti-Submarine Warfare (ASW) – The Heart of Surface Warfare” and “Increasing Lethality in Anti-Surface Warfare (ASUW)”. Both of these officers were recently selected for flag rank, and the Surface Force could not be more fortunate. Their years of fleet experience in these mission areas uniquely qualify them to lead our force in the future. Together with our continuing mastery of land attack and maritime security operations, the three operational thrusts they describe a Surface Force that is moving from a primarily defensive posture to one on the offense. This is an exciting development, and I want to spend a few paragraphs reinforcing their messages. The single most important warfighting advantage that the U.S. Navy brings to the joint force is the ability to project significant amounts of combat power from the sea, thousands of miles from our own shores on relatively short notice and with few geopolitical restraints. No one else can do this, and for the better part of two decades, our ability to do so was unchallenged. Without this challenge, our mastery of the fundamentals of sea control—searching for and killing submarines, over the horizon engagement of enemy fleets, and long range air and missile defense—diminished, even as the world figured out that the best way to neutralize this power projection advantage was to deny us the very seas in which we operate. Surface Warfare must “go on the offensive” in order to enable future power projection operations. I call this “offensive sea control” and it takes into consideration that in future conflict, we may have to fight to get forward, fight through our own lines, and then fight to stay forward. Pieces of ocean will come to be seen as strategic, like islands and ports, and we will offensively “seize” these maritime operating areas to enable further offensive operations. Put another way, no one viewed the amphibious landings in the Pacific in WWII as “defensive”; there was broad understanding that their seizure was offensive and tied to further offensive objectives. It is now so with the manner in which we will exercise sea control. What does this mean to fleet Sailors? It means that we have to hit the books, dust off old TACMEMOS and begin to think deeply again what it means to own the inner screen against submarines, to hunt down and destroy adversary surface vessels over the horizon, and to tightly control the outer air battle. We need to study the threats and devise new tactics designed to counter them. We need to master the technology that is coming to the fleet—Navy Integrated Fire Control (Counter Air), or NIFC-CA; the Air and Missile Defense Radar (AMDR); the SQQ-89 A(V)15 ASW Combat System; the LCS ASW Mission Module; the introduction of the Griffin missile in the PC class; new classes of Standard Missiles; Rail Gun; Directed Energy. We will need to use these systems and then do what Sailors always do—figure out ways to employ them that the designers never considered. Going on the offensive is a mind-set, a way of thinking about naval warfare. It means thinking a good bit more about how to destroy that than how to defend this. Don’t get me wrong—we will still need to be able to defend high value units, amphibious forces, convoys, and logistics—but we will increasingly defend them by reaching out and destroying threats before those threats are able to target what we are defending. We are moving to a concept of dispersed lethality in the Surface Force, one that presents an adversary with a considerably more complex operational problem. It will not be sufficient to simply try to neutralize our power projection forces. While these will be vigorously defended, other elements of the surface force will act as hunter/killer groups taking the fight to the enemy through the networked power of surface forces exercising high levels of Operational Security (OPSEC) and wielding both lethal over-the-horizon weapons to destroy adversary capabilities and sophisticated electronic warfare suites to confound adversary targeting. Especially in the Pacific, vast expanses of ocean will separate the carrier air wing from dispersed surface operations, so the paradigm of the past few decades that suggested the carrier would provide strike assets to supplement the Surface Force is no longer valid. We will leverage air wing capability, but we will not be dependent upon it. Working in tandem with shore-based maritime patrol aircraft and our organic helicopters, we will seek out and destroy adversary submarines before they threaten high value units or fielded forces. Bringing together the networked power of surface IAMD forces and the mighty E-2D, we will dominate the outer air battle, eliminating threats to the force at range. The Surface Force will seize strategic “maritime terrain” to enable synchronized follow-on operations. Those who may ask how the current fiscal environment impacts this vision, my answer is that it does so substantially. We will be forced to favor capability over capacity. We will favor forward deployed readiness over surge readiness. We will continue to invest in forward-looking capabilities through a strong science and technology/research and development budget, while ensuring we accelerate those promising technologies closest to fielding and most effective in advancing our offensive agenda. We will posture more of the force forward, and more of it in the Pacific. While the total size of the fleet will likely decline if current conditions continue, more of it will be where it needs to be, it will be more effectively networked over a larger more dispersed area, and it will be equipped with the weapons and sensors necessary to enable this offensive shift. I am bullish on Surface Warfare, and you ought to be too. I look forward to continuing this dialogue on the Renaissance in Surface Warfare, and I am proud to be part of the greatest Surface Force in the greatest Navy the world has ever known! Rear Admiral Thomas S. Rowden’s current assignment is on the Chief of Naval Operations Staff as director, Surface Warfare Division.A native of Washington, D.C., and a 1982 graduate of the United States Naval Academy, Rear Adm. Rowden has served in a diverse range of sea and shore assignments. I’d be more bullish if unit productions costs weren’t $2 billion per destroyer. .I don’t care how you word it we don’t need to be there! its common sense! just bring our men and women home let them fight their own war! again how many lives are you willing to give what about your life or your family ? how would you feel if your only son , your namesake son was there would you feel the same way then? and when they come home are they going to get paid for the rest of their lives like Congress does? you people in Washington that wear your suit and ties and are able to go home to a warm house and a nice bed and food in your belly tell me … Are you wearing combatboots ,and don’t have to carry guns, ? you don’t have to worry about these things that normal people do. .when you put your boots on and have to carry a gun to defend your life , and leave your family , then you can pretend to tell us what you think is right !!!!!!!!! As the Navy transitions from an era of unchallenged maritime dominance to operations in increasingly defended areas, it needs to get back to serious thinking about the threats, development of new countering tactics, and the structuring equipping and training the surface navy to engage in successful offensive operations to defeat those threats. 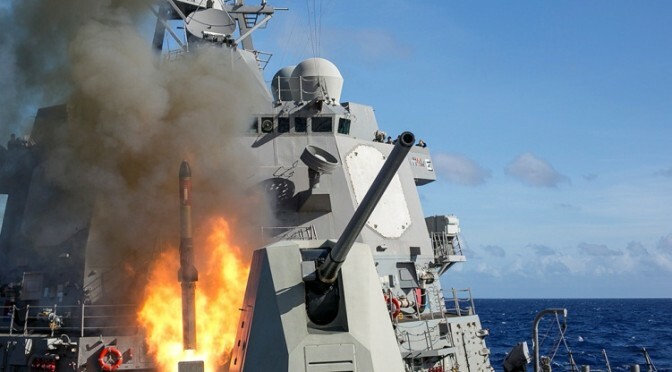 An example of such thinking and analysis is Jonathan F. Soloman’s excellent master’s thesis titled: Defending The Fleet From China’s Anti-Ship Ballistic Missile: Naval Deceptions Roles in Sea based Missile Defense. One key to success in Surface Navy offensive operations is to avoid the detection, classification, identification, tracking, and targeting required by the enemy to mount successful attacks. Since the demise of the Soviet Union and in the near absence of threats, the DoD and Navy have embraced the transition to Net-Centric warfare (aka FORCEnet) with extensive reliance on robust satellite communications, IP based networks, and tactical data links such as LINK 16, CEC, TCDL. RF emissions from these and other shipboard emitters provide the adversary the basis for success in surveillance and targeting. This suggests a new focus on methods and tactics that deny that success. Examples are fleet operations including air group launch and recovery in EMCON ALFA; increased reliance on off board threat information received via broadcast methods (IBS/GBS); improved METOC and mission planning tools; and, the training of tactical commanders for the difficult decision regarding the transition from denial of surveillance and targeting to activation of RF sensors, communications and data links for active defense/attack. A second and related key to success in denying surveillance and targeting would be to create/revitalize a “red” force to test and measure fleet unit success in denying surveillance and targeting and in practicing the passive to active transition when tactically advantageous. The employment of such a “red” force in fleet training exercises would offer a stimulating challenge and serve as a strong catalyst for effecting the Surface Navy’s mindset transition from the defense to effective offensive operations in contested areas. If more stimulation is desired, the “red” force could be the USAF using USAF assets such as RIVET JOINT and national systems adding an inter-service competitive aspect to the events. Is the author also considering its allies to add to the numbers that are dispersed to break through the A2/AD backed by China’s Second Artillery?